Yoshi has many friends. He hangs out with Yolanda, Yuri, Yasmine and Yang. 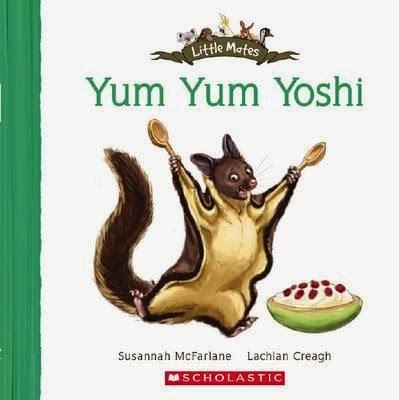 Of all these Yellow-bellied gliders it is Yoshi who loves food the most. He’ll eat anything from Yams to Yum Cha. One day, however, Yoshi wakes up feeling yicky. All his friends try to help suggesting many activities which may help him to feel better. Nothing seems to be helping. Then they remember his favourite food. Will that do the trick? I have been enjoying this pocket-sized series of alphabet books. Featuring a great variety of Australian native animals these stories have such a great flavour of our bush, outback and other Aussie settings. I love the tongue-twisting alliteration. And although this must be hard to construct for some of the curlier letters towards the end of the alphabet such as Y, the author does well. ‘And yummy yum cha whilst yachting?’ suggests Yasmine. With just one more to go, what does Z have in store for us?